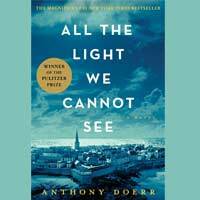 The March pick for the Webster University Book Club is the 2015 Pulitzer Prize winner All the Light We Cannot See by Anthony Doerr. Join us as we discuss the novel on March 21 at noon in the Library Conference Room. Everyone is welcome! Marie-Laure is a twelve-year-old who is blind. With her father, she must flee Nazi-occupied Paris to live with her great-uncle near the sea. They travel with a secret that the Nazis want. Werner is a young Nazi soldier whose skill with radios has landed him an assignment tracking down French Resistance fighters. The stories of Marie-Laure and Werner converge in the village of Saint-Malo as both struggle to survive. Click here to view the Webster University Book Club selections for 2016 .